Ditch the fine-dining and find cheap meals in Chicken Tsunami. You get a meal consisting of one cup rice and one-piece chicken for 25 pesos. You can have three pieces of fried lumpia for 10 pesos. That's not all. Buying six pieces of chicken costs only 99 pesos. Chicken Tsunami is behind Victoria Plaza and is just outside the Park n' Shop exit (Park n' Shop is Victoria Plaza's grocery store). 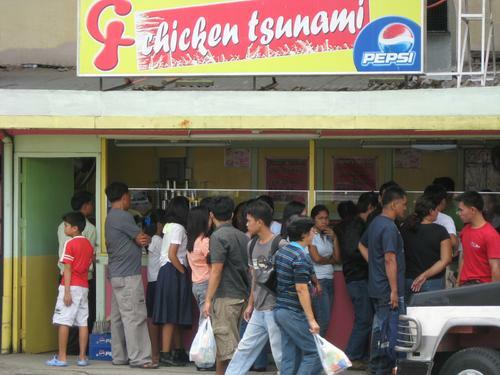 Be prepared for long lines and crowded spaces as Chicken Tsunami tends to be crowded especially on lunch hours. The place is also very small for a restaurant. You can order food for take-out if you dislike crowds.